Justin Rao and David Reiley have a new paper in the Journal of Economic Perspectives on “The Economics of Spam.” It is a very interesting read; especially for the historical overview of the phenomenon. I had the opportunity to discuss the paper at the NBER Summer Institute and so I thought I’d record my thoughts here. One part of the paper that has attracted the most attention was the calculation of the extent of the externality caused by Spam — specifically, email spam. The benefits to the spammers is a whole forensic story that I won’t go into but gives an estimate of around $300 million per year. The costs come from user costs and technology costs. The user costs are the 900,000 daily spam emails that jump current spam filters multiplied by the costs to each user of dealing with them. It is that last bit that gets a little rubbery. The authors suggest that it takes 5 seconds to deal with each errant email and at an average wage of $25 per hour all this adds up to $14 billion per year. However, my quick survey of others suggests that dealing with spam actually takes more like 1 second. In that case, the user costs of spam would be $2.8 billion per year. And the distribution of wages really matters in terms of cost and it is hard to know which way that goes. The point is that there is a big margin of error. That margin carries over to the technology costs of dealing with spam. The authors guesstimate $6.5 billion for this which is about the annual revenue of Symantec. But this is based on costs paid out by businesses and does not take into account benefits to online security firms. So it is hard to tell how high the real costs are. Nonetheless, if you take these costs and divide them by the benefits to the spammers, it is a very high number. It is much higher than other forms of marketing. And it is much higher than other externalities such as driving cars or, indeed, stealing cars. But it isn’t too high compared to things like terrorism. But all this raises a question: what is the economics of spam? The externality view suggests that it is a market failure worthy of government intervention. But is that classic externality the right way to think about it? If so, then surely much advertising falls into this class (despite having a much lower cost). On the other hand, it is more like criminal activity. That might be easy to consider but it is an interesting form of criminal activity. Indeed, reading the history of spam, you could be forgiven as seeing spammers are classic entrepreneurs. There is a ton of talent involved there. Seen in that light perhaps we should see this as criminal entrepreneurship. What is great about that is we know a lot about how to encourage entrepreneurship and innovation and so to deal with spam we just need to throw that into reverse. Countermeasures make spamming costly. If spammers had great alternative opportunities — this time Wall Street may actually help in an appropriate allocation of talent — criminal entrepreneurship would be reduced. Maybe the whole mobile app revolution has already had this impact. Finally, counter-attacks might reduce spam returns. A few years back I contacted Yahoo and Google with an idea to counter spammers. What if for each spam email that they picked up, they responded — perhaps entering details into phishing forms? This would overwhelm spammers and they would not be able to find ‘legitimate’ responses from the gullible few. That would really alter their returns. Unfortunately, it was explained to me that such a measure would constitute an attack by a US corporation and, apparently, that is against US law. However, we are a step ahead of ourselves here. 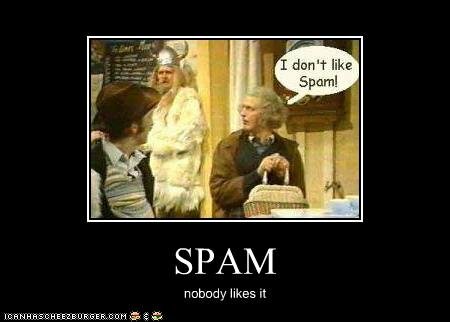 To really consider a policy response it is useful to think of who actually likes spam? We know that users hate it which is why we can leap to action in getting people to deal with it. Drug companies hate it too as it harms legitimate marketing efforts. But on the other side of the equation there is an industry. The spammers obviously would like to spam more but because there is a continual arms race involved, the arms dealers (that is, online security firms) also benefit from the existence of spam. So while we can expect them to be outwardly sympathetic, in reality, the last thing they would want is a permanent and effective policy solution. Finally, the paper points out that incumbent email providers have also benefited from spam. Yahoo, Microsoft and Google all have high market shares in email because their spam filters are good and benefit from their own scale. As a rational economic matter, their incentives to deal with spam must likely be considered as no greater than what users would want. If firms were not investing in anti-spam technology, end users would be receiving 100 times as much spam, which given our estimate of the current time loss due to 100 times as much spam, which given our estimate of the current time loss due to spam, would put the total economic loss at over $1 trillion. However, without any spam filtering it is unlikely that email would be a popular means of communication, spam filtering it is unlikely that email would be a popular means of communication, so while one cannot take this number literally, it does give a feel for the magnitude of user time savings resulting from private investment in anti-spam technology. Basically, we would lose email as a means of communication. But what would be the costs of that? That $1 trillion will never be realised and so can’t be believed. But if it takes $8-$20 billion per annum to keep email operational, that appears to be the price of having email. Indeed, it is the price of a particular form of email — open access email — whereby people you don’t know can send messages to you. Seen in that light I wonder if the price is worth it. Perhaps what we want is a closed circle of email — something that Facebook has appeared to be moving towards. In any case, the economics of spam appears to be the cost of doing a particular form of business that is itself in no more need of government resources than any other. It would be nice to lower the costs of doing that business but the beneficiaries need to pay for that. @ JoshuaGans: Superb read! Some of the same principles apply to viruses and malwares too (specifically, of anti-virus companies having an interest in perpetuating them). I don’t believe that open access email will go away anytime soon, although I do think that Facebook’s messaging system will grow quite a bit in years to come. Likelihood is that people will have both systems. What’d be interesting to watch is if either Google or Yahoo or MSN begin charging for their anti-spam features. There’s probably be an outrage but you never know. Look forward to reading more about the economics behind emails from you. Good work, btw. PS: Just a copy-error heads-up: The block quotation has several duplicate lines. Spam is serving an end user market ranging from people who want to buy (legitimate) pharmaceuticals cheaper than they can in the US, those who want recreational usage, businesses who accept affiliate marketing by any means, all the way to greedy (and somewhat ignorant) people who believe that some money sent to Nigeria or purchasing a particular penny stock will likely enrich them. While these people exist, entrepreneurs will find a way of serving/fleecing them. Previous PostPrevious Does the clothesline paradox apply to IT?